Hey，my dear friends. 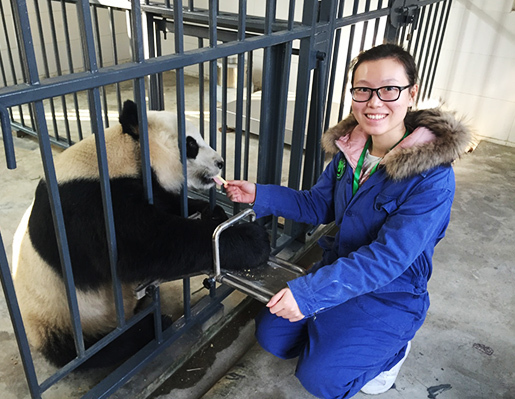 Today Vivien is so excited to share the fantastic 1 day Panda volunteer tour experience with you. Come on. Vivien will show you how lovely pandas are. Dujiangyan Panda Base (also Dujiangyan Panda Ark) is located in Qingchengshan Town (named after Mt. Qingcheng) of Dujiangyan City. Covering an area of 760 acres, Dujiangyan Panda Base is aimed to improve the panda’s living condition and ecological protection. At present, there are more than 30 giant pandas and 5 red pandas living here. Vivien and friend got up very early in the morning for catching our bullet train from Chengdu to Qingchengshan Town at 6:48 am (C6101). Around 1 hour’s train and bus travel, we arrived at Dujiangyan Panda Base. We were very excited and took picture before the Panda base. We took a walk around the base for half an hour. Around 08:30 in the morning, the ticket office began to work, visitors lining up to buy tickets. Because we made an appointment for the Panda Volunteer work in advance, therefore the guide in the volunteers’ workstation contacted us and showed us into the base. 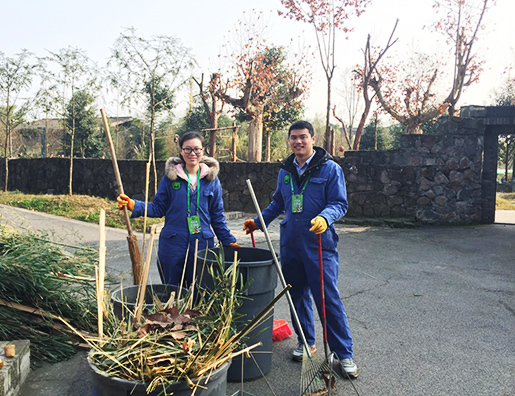 After learning the safety announcement and signing the security agreement in the workstation, we put on our work clothes and gloves, wore our volunteer pass card, then our lifetime panda volunteer experience started. 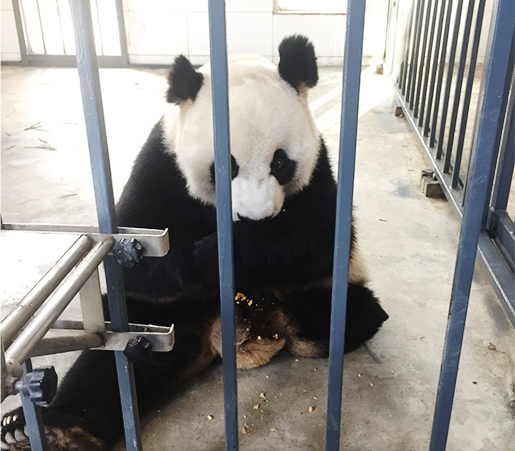 Our working place on that day was PanPan Garden, there are 4 pandas living in PanPan Garden, the hero mother Yingying, the cute twins Bingbing and Qingqing, the gentle one-legged panda Dali. On the road to the PanPan Garden, our guide told us matters need to attention. We started our work from cleaning the outside house of Yingying. 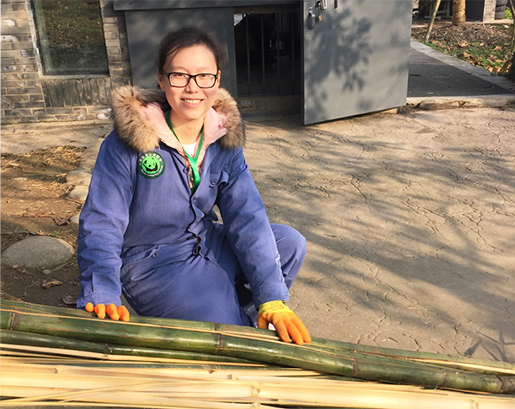 Carrying out old bamboos, picking up droppings, cleaning up panda enclosures, carrying in fresh bamboos leaves and shoots, we feel so happy to work for these lovely pandas. 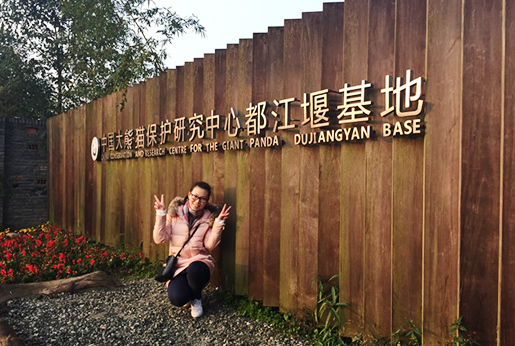 After these works, we took a visit to other panda enclosures in Shuangnan Garden, Diequan Garden and Linze Garden, walked around the panda base for more giant pandas and red pandas. Our guide told us lots of stories of the different pandas and we feel so happy to take many pictures and videos of them. I love that day so much. Following, come to the most excited part, feeding pandas. That day, we fed Dali. Remember Dali? He was been rescued on the day Feb 27th 2001 in the afternoon by two miners, that day he was falling off the cliff after heavy hurt by a wild beast. Very sad, he lost his left leg although veterinarians and panda protectors try best for him. From then on, he live in panda base, although he lost one leg he is very gentle and mild. I am very impressed by him in the PanPan garden. We had break time in the workstation after lunch in the staff dining room inside the panda base. Following, we watched Panda Documentary in the workstation and know that how’s a baby panda to be a mature one, we know so much of the panda from the documentary and are very proud of we have the chance to have this one day work. 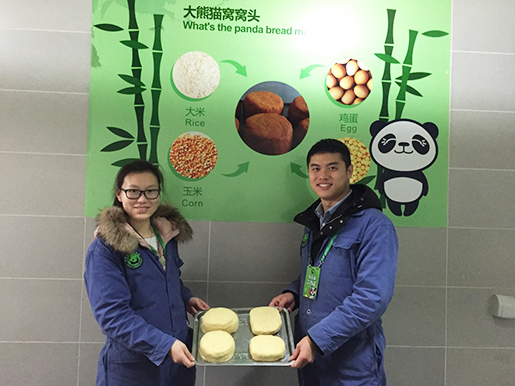 After documentary, we cleaned the panda enclosure and fed the panda again. Also, we prepared our own panda cake for them. How nice! After our whole day’s panda volunteer experience, we got the panda volunteer souvenirs before we say goodbye to the lovely pandas. I am so proud that I have this lifetime experience and I really want more and more people can have the same happiness with panda as I am. Just come, panda volunteer will for sure leave you an amazing memory. Want know more information about panda volunteer, check the details at Giant Panda Volunteer Programs. In fact, there are other panda bases including Chengdu Panda Base, Wolong Panda Reserve and Ya’an Bifengxia Panda Base. 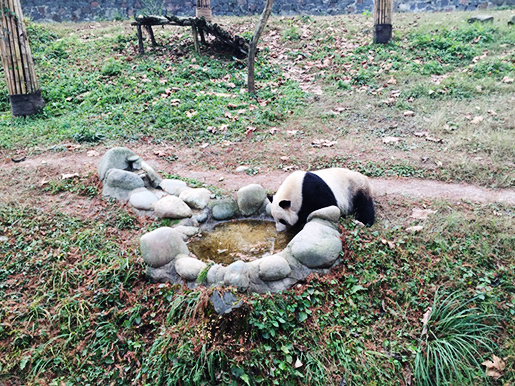 If you are interested, turn to Panda Tours with different experiences. Feel free to select your favourite to explore the Giant Pandas! Want to know more about the experienced travel expert Vivien’s trip? You could just contact her directly. This entry was posted in China Attractions, sichuan tour, travel experience, travel guide and tagged Dujiangyan Panda Base, Dujiangyan Tour, Panda Tour, Panda Vounteer by Travel Expert. Bookmark the permalink.